Other than binding it, I do still need to make a label for it. What information should I put on the label? I guess you should know that this is a commission quilt, but I was told "do it, I trust you" (or something like that. ) Plus I sort of know the mom-to-be whose little boy this will be for. So what should I put on the label? I know I am putting his first name. Other than that I am open for suggestions. Also how do you make your quilt labels? I am ashamed...I rarely label my quilts...dont hurt me!! Name of the quilt, his name, date, and your name. I usually make the label with my embroidery machine. I make mine on my emb. Machine. Sailing Lonf with .....the child's name would to cute, plus your general info. Good ideas from the others. Having no embroidery machine, I use my computer to print on fabric for my labels. The program at our guild meeting this month is going to be on inking quilt labels! I'm excited to learn how to do this by hand as I usually print my labels on the computer. I'm sure it's easier using the computer printer, but much more personal if it's done by hand! Being that this is a commission quilt, I would list the information that Maddie suggested and maybe add the town/state as well. Really cute quilt. I've been thinking a lot about wavy lines lately with the trend toward modern quilts. Guess I'm going to have to stitch some. 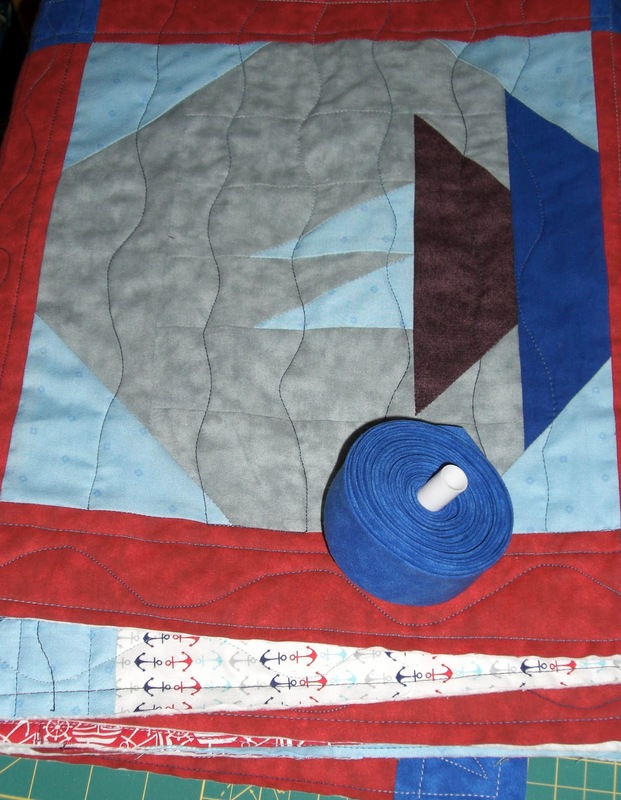 I try to label family quilts and commission quilts. In the past I have always used the printable labels. I think EQ has great label fabric, and they print beautifully and the ink really stays with them. You can be fairly artistic on the computer. But I recently bought font engine for Embird and have purchased some labels from EmbLibrary and added text with Embird, and I really like those labels too. Quilt designed, pieced, and quilted by ________ (a lot of the time it's more than one person. Short quote or sentimental saying. I sew the label to the back of the quilt at a corner. I'm afraid I am not much help....most of mine are for family so far, so Madame Samm made me a logo that I put on the iron-on transfers that I feed through the printer. They look nice (and she made it so cute) but I'd love to know how to do a "real" one. It's been fun reading these comments and learning about labels.